Sue Robinson writes that she was walking the shore at Bayview Beach, Milwaukee, WI, USA, early afternoon. She saw this bright object on the beach and at first thought it was plastic, like a top of something. 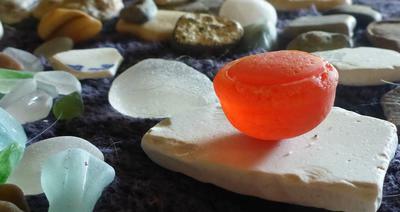 But when Sue picked it up she saw it was a thick piece of orange beach glass. 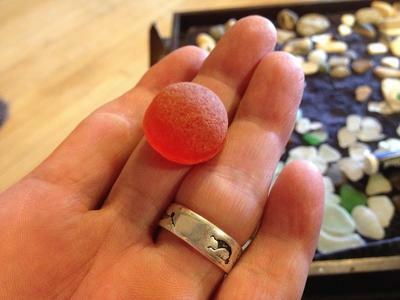 She entered a photo in the photo contest but was also wondering if anyone could give her some clue as to what this orange half-sphere beach glass might be. Comments for Orange Half Sphere Beach Glass? Thanks for posting this David. I tried a couple of times but I thought the page had stuck and didn't take. Well, Sue, it probably did stick! I knew you wanted the photos here to get some ID, so posted them for you.